Read more about the responsibility of intellectuals. 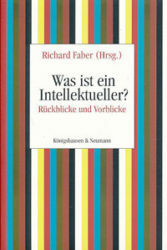 ‘What is an intellectual?’ is the question posed by sociologist Richard Faber in his new book Was ist ein Intellektueller? Rückblicke und Vorblicke. The collection of essays originates from a series of lectures at the Freie Universität Berlin in the summer of 2010. While each author tries to give an individual answer to the question, the majority shares the approach of portraying one or more prominent thinkers in their time in order to explain why these could or should be recognized as intellectuals. The objects of research range from ancient philosophers to contemporary Joseph Ratzinger, who recently surprised the world by resigning as Pope Benedict XVI. In recent years, the debate on public intellectuals in Germany has led to a number of books and essays on the topic. Among these, socio-historical case studies of groups of intellectuals or biographies of individuals prevail. The focus lies predominantly on the twentieth century, as it is commonly agreed that the birth of the public intellectual is marked by Emile Zola’s famous advocacy for wrongly convicted officer Alfred Dreyfus, which appeared in the newspaper L’Auroreunder the headline ‘J’accuse’. In the context of the Dreyfus affair, the term ‘intellectuals’ was coined, describing those exponents of the educated class who publicly supported Zola’s open letter with a signed declaration. Due to the manner of intervention, using the emerging mass press, the origin of the intellectual is intrinsically tied to the emergence of modern media in the late nineteenth century. Richard Faber wants to add a new perspective to the debate by separating word origin from concept of the public intellectual. Thus, he claims that the history of the intellectual does not start with the turn of the twentieth century but ‘much earlier: even with ancient Israelite prophets and apocalypticists, Greek sophists and rhetoricians, as well as Cicero, Paul the Apostle, the Renaissance humanists and French philosophers à la Voltaire – especially since they were time and again referred to, yes, even invoked by modern and contemporary intellectuals’.The benefit of this approach is that, in allowing to place current research on nineteenth and twentieth century intellectuals into a wider context, it raises awareness of the fact that intellectual intervention has existed long before the Dreyfus affair and the coinage of the term ‘intellectual’. However, though this is a creditable attempt to animate the debate, it brings about two interconnected problems. Firstly, the separation of term and concept (or speaking with De Saussure: signifier and signified) of ‘the intellectual’ does not seem valid with a term whose etymology is so closely connected with a specific event. This is particularly the case considering that the event was so unique in its use of mass media to stand up for ‘truth and justice’ (Zola) that a new term had to be coined in order to describe what was happening. Secondly, Faber does not address the issue of the public sphere. Since making one’s standpoint known in public is inevitably part of the concept of the intellectual, it is seen as a phenomenon of (mass media) modernity by most scholars. Therefore, Faber’s approach will almost certainly provoke the criticism of the disciples of Begriffsgeschichte (history of concepts). The essays assembled in this edition give a good insight into current German research on intellectualism and intellectuals. While they prove to be quite heterogeneous in style as well as in methodological approach, it is striking that the majority of authors have decided to concentrate on the question of the function of intellectuals rather than touching the concept of the public sphere. In the following, some of these contributions are outlined briefly. Two articles broach the issue of the intellectual quality of prophets. Jürgen Ebach, a theologian, focuses on biblical as well as modern prophets and stresses the possibility of failure as an integral part of prophecies. In a similar approach, cultural scientist Olaf Briese looks at twentieth century apocalyticists, especially Günther Anders, as radically critical intellectuals who make use of apocalyptic prophecies in order to create as much public attention as possible. Philosopher Francesca Vidal highlights the impact of rhetoric ability on critical thinking by going back to Aristotle, Cicero and Quintilian. In her opinion, Aristotle has to be understood as an intellectual avant la lettre as he regarded rhetoricians to be obligated to use their persuasive skills in service of the common good of the polis. Moreover, she demonstrates that rhetoric abilities were an essential trait of intellectuals who tried to influence the formation of public opinion in a time before the distribution of written expressions of opinion. At the end of her paper, Vidal points out the topicality of rhetoric ability in the context of modern educational ideals, which combine persuasive eloquence and critical thinking as a requirement for democratic competence. In an essay on the intellectual qualities of Karl Marx, Wolfgang Eßbach describes how Marx’s perception as radical journalist, scientific socialist, founder of historical materialist ideology and revolutionary mastermind is time-dependent. Gramsci specialist Peter Jehle chooses a more theoretic approach in order to demand a concept of the intellectual which is based on Sartre and Gramsci inasmuch as modern intellectuals have to be classless critics whose virtual duty it is to intervene in issues that according to prevailing opinion are none of their business. The German-British sociologist Ralf Dahrendorf is depicted by historian Gangolf Hübinger as an ambivalent type of a twentieth-century intellectual. In his different roles as scholar, journalist and politician, Hübinger argues, Dahrendorf always stood by his key convictions on liberty and democracy and kept up Europe as a frame of reference for his public interventions. So what is an intellectual? First of all, it seems that in order to belong to this species one has to be male: the anthology does not contain one single essay portraying a woman in this role. Given the fact that over centuries, women have been assigned subordinate positions in social life, this is not very surprising. What is astonishing, however, is that this lacuna is not mentioned in the book. Furthermore, in the light of the on principle valuable attempt to bring together interdisciplinary as well as diachronic approaches to answer the question of the composition of an intellectual, it is unfortunate that Faber did not take the opportunity to tie the loose ends together in a systematic knot by writing a conclusion – this might have helped to come up with a new, universal and diachronic definition of an intellectual. Thus, the question posed by the book remains unanswered – though we may set our hopes on the follow up anthology Intellektuelle und Antintellektuelle im 20. Jahrhundert, the upcoming appearance of which is announced in the foreword. Cf. a cursory compilation of recent publications: Dietz Bering, Die Epoche der Intellektuellen 1898-2001. Geburt, Begriff, Grabmal, Berlin University Press, Berlin, 2010; Alexander Gallus, Heimat ʺWeltbühneʺ: Eine Intellektuellengeschichte im 20. Jahrhundert, Wallstein, Göttingen, 2012; Ingrid Gilcher-Holtey, Eingreifendes Denken. Die Wirkungschancen von Intellektuellen, Velbrück, Weilerswist, 2007; Gangolf Hübinger, Thomas Hertfelder (Ed. ), Kritik und Mandat. Intellektuelle in der deutschen Politik, DVA, Stuttgart, 2000; Thomas Jung/Stefan Müller-Dohm (Eds. ), Fliegende Fische. Eine Soziologie des Intellektuellen in 20 Porträts, Fischer, Frankfurt a. M., 2009; Joseph Jurt, Frankreichs engagierte Intellektuelle: Von Zola bis Bourdieu, Wallstein, Göttingen, 2012; Daniel Morat, ʻIntellektuelle und Intellektuellengeschichteʼ in Docupedia-Zeitgeschichte, 11/20/11, URL:http://docupedia.de/zg/Intellektuelle_und_Intellektuellengeschichte?oldid=84628; Paul Nolte. Intellektuelle in der Politik. Unentbehrliche Analytiker der Lage, in Indes 1, 2011, p. 51–54; Jutta Schlich (Ed. ), Intellektuelle im 20. Jahrhundert in Deutschland. Ein Forschungsbericht(Internationales Archiv für Sozialgeschichte der deutschen Literatur, Sonderheft 11), Niemeyer, Tübingen, 2000.